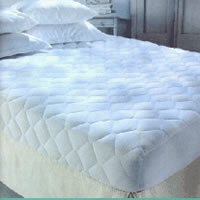 Advanced Sleep Products offers a wide variety of mattress pads for all your bedding needs. All pads are made of top quality polyester fiber in different styles including anchor band, contour fitted, and the fitted style. Each are graded with different weights of polyester felt and cotton or poly-cotton cloth. The pad is attached to the mattress using elastic band at each corner. Not available in Round sizes. Super Single 48" X 84"
This pad is quilted and the sides are a polyester fabric that is elasticized for the best fit. Available in your choice of 3 styles.